The scene is from what must have been a very scandalous affair in Victorian England. 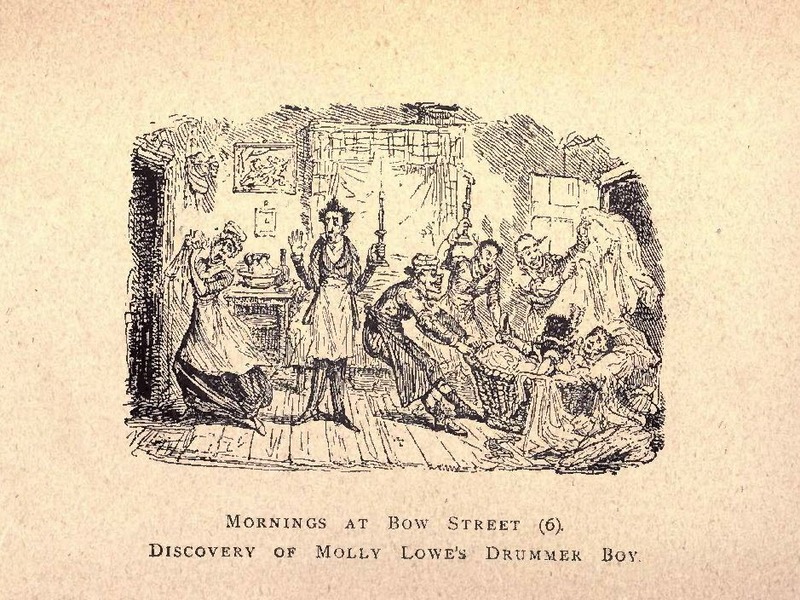 A woman named Molly Lowe, who was forty years old and a housekeeper for a man of means, began having an affair with a younger man, who was a Drummer in an army regiment. The master of the house was warned of her indiscretion by an anonymous letter, and upon investigating discovered Molly's lover hidden in a clothes hamper. Despite protestations that he was her cousin, both were taken before the magistrate. The home owner graciously declined to press charges, and satisfied himself with firing the love stricken Molly. The poor drummer boy was sent back to his Regiment to be punished by his commanding officer. Today, it is hard to tell what they actually did wrong. But it was enough of a scandal that the search for Molly Brown's Drummer Boy turns up several articles and passages in books written about this at at the time. Things have sure changed.